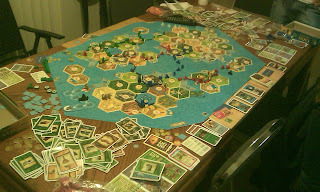 Mega Catan: A combination of basic Settlers of Catan, Harbormaster, Fishermen, Rivers, Cities and Knights, The Wonders of Catan, Barbarian Attack, Traders and Barbarians (the scenario) and basic Seafarer rules. There is no Largest Army card. The game starts with no thieves. In game terms, a “thief” is the robber, the pirate or any barbarian. Place the Cities & Knights Production Cards (Green, Blue and Yellow) as well as Traders & Barbarian Development cards on the side of the board. If playing with 5 or 6 players, the “Special Building Phase” is available to the players. 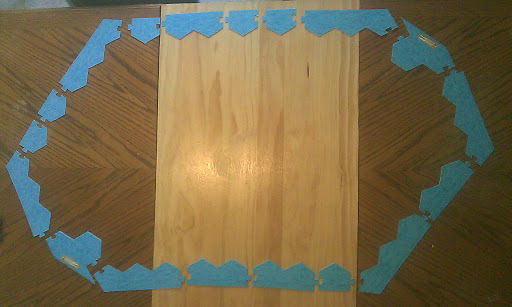 Each of the Trade hexes should be on separate islands and as equidistant as possible. The main islands should be connected by Straits (the location for the Great Bridges). There should only be two straits, not three, so not every main island will be connected with each other main island. Place Catan chits at the Strait to indicate where the Great Bridge may be built. None of the main islands should have gold hexes and none of the gold hexes should have favorable or unfavorable numbers (6s, 8s, 2s or 12s). The Wasteland for the Great Wall should be on the far side of one of the main islands, and not get in anyone’s way and should not have any unfavorable (2s, 12s) numbers adjacent. Each island should have a river. No intersection should have a harbor and fish tile. Each main island should have at least 1 favorable number (6 or 8). No single main island should have more than 3 favorable numbers. There should be no adjacent favorable numbers, nor any adjacent unfavorable numbers anywhere on the map. There must be at least 1 desert on the map that does not make up part of the Wasteland. During player set-up, players first place a settlement, and then a city. They draw their initial resources from the city. Players who begin with a city on a fish tile, draw one fish token. Players may only place their initial settlement and city on one of the larger main islands. Players may not place any starting locations adjacent to the Wasteland nor at either Strait. All players start with 5 gold coins plus any additional gold gained from building adjacent to a river hex. Players may place a ship next to their starting settlement or city instead of a road, if they choose to do so. Whichever islands a player begins on, that island (or those islands, if a player starts on two separate islands) are considered his “homeland”. Each island, including those smaller islands, that is not a player’s homeland, is considered a “foreign land”. 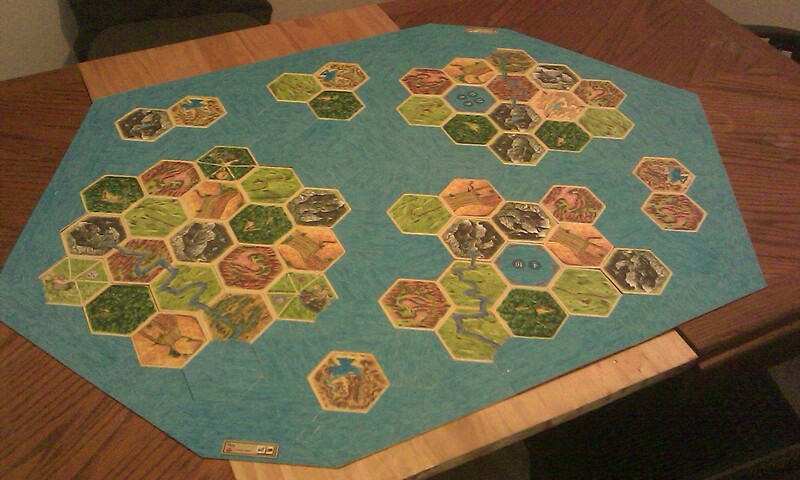 The first time a player builds a settlement on a foreign land, that player places a Catan Chit under that settlement. That Catan Chit sounds as 1 bonus victory point, making that settlement worth 2 VP. If the settlement were upgraded to a city, it would be worth 3 VP. It does not matter if a player is the first to settle an island, each time each player settles an island they have never settled, they gain 1 special VP. In any case where a card or rule uses terms like “Robber”, “Pirate”, or “Barbarian”, any of the thieves may be changed for that instead. For example, the Bishop Progress card may be used to move the pirate or a barbarian instead. The only exception to this is the Roving Barbarians rule, where each time a thief is moved, an additional barbarian is moved. This is always only a barbarian. Anytime the player relocates a thief by any means, except spending by 2 fish or displacing with a knight, displacing with the baggage train or having moved a barbarian with this rule, they may relocate an additional barbarian. Two barbarians can be moved at once in this way. The additionally moved barbarian can never be used to steal resources. The first time the barbarians invade, they leave the robber in the desert, the pirate offshore (meaning to the side of the map, but it can return in any normal means) and the three barbarians in their starting positions next to the trade hexes (the second outward road branch from the right). From this point on, whenever the barbarians invade, the leave an additional barbarian in Catan. If the barbarians also defeat Catan, they leave an additional barbarian, two in total. The player whose turn it is gets to decide where the barbarians are placed. Also after the first invasion, place an amount of gold on the barbarian advancement board equal to the number of players plus 1. This represents the gold stores on the pirate ship, which can be plundered by the player’s knights, as discussed later. If the pirate ship is adjacent to a harbor, the player controlling that harbor must pay 1 gold to the pirate ship to allow safe passage. This gold is placed on the barbarian advancement board, and is added to the pirate’s gold stores. This gold can be recovered later by any players, as described in the Knights section. While the pirate is on a hex which would otherwise allow players to draw a fish token from a fish tile, the pirate prevents all players from drawing any fish tokens. If a single hex ever has three or more barbarians (or knights, described later) adjacent to it, that hex is conquered and the production chit is flipped over. A conquered hex has several downsides for the players. A conquered hex produces no resources. No new settlements, roads, bridges nor ships may be build adjacent to a conquered hex. Settlements already on a conquered hex still may be upgraded to a city. If a settlement or city is surrounded by nothing but conquered hexes, that settlement or city is conquered. A conquered settlement/city provides no victory points. If a conquered settlement/city controls a harbor, that harbor is no longer usable until the settlement/city is unconquered. A metropolis surrounded by conquered hexes is not conquered. It still counts for victory points, but since it is surrounded by conquered hexes, still produces no resources. Only once a conquered hex no longer has any barbarians adjacent to it, is it no longer conquered. Flip the production chit right side up and the hex functions as normal until it has three barbarians adjacent again. Players can also use their own active knights to count as barbarians for the purpose of conquering a hex. To use a knight towards conquering a hex requires the knight to be active and adjacent to the hex to be conquered. The controlling player may use his knights towards conquering a hex without using his knight’s action, and must announce his intention to work towards conquering the hex only before the production dice are rolled each turn. A player does not have to use his knights towards conquering a hex, if he does not wish to. Multiple players may work together (and even with barbarian’s help) to conquer a hex. A knight can travel along a sea route just as easily as they can travel along roads. In this way, they are able to chase off the pirate. Knights can move along shipping routes like any other road. In this way, they can reach the pirate ship. If a knight uses his action while adjacent to the pirate, he is able to plunder the pirate ship. In doing so, the player recovers 1 gold for each level of his knight. The gold is taken from the available gold on the barbarian advancement board. Players can not take more gold than there is on the advancement board. After the gold is plundered from the pirate ship, the ship moves off the board and can be placed back on the board as normal at a later point. Knights can be used to chase off adjacent barbarians as well as the robber and pirate. A knight does not have to roll to chase off a barbarian, like the Baggage Train does, only needs to be active. Chasing off a barbarian deactivates a knight. An active mighty knight has the option to, instead, arrest an adjacent barbarian, removing the barbarian from the board and deactivating the knight. The owner of the knight receives 3 gold for the bounty on the barbarian. Chasing off a barbarian does not allow the owner of the knight to steal a resource card from a player adjacent to the new location of the barbarian. Chasing away or arresting any thief does not allow the controlling player to steal any resources. Knights function as barbarians for slowing down a baggage train of an opposing color. Knights do not slow down baggage trains of their own color and only active knights can delay an opposing Baggage Train at all. The baggage train can still attempt to drive the knight off in the same way it can drive off barbarians. However, knights are better trained and the baggage train subtracts the knights strength from its roll. If a baggage train successfully drives off the knight, the baggage train displaces the knight as per normal rules for displacing a knight. Because knights are placed on intersections, rather than boundaries, when a baggage train gets to an intersection adjacent to a knight, the knight moves onto the boundary between them, for purposes of determining their interaction. The knight has not actually moved onto the boundary, it is just a symbolic representation. The players controlling the knights can allow other players’ baggage trains to pass by their knights without conflict if they so choose, in exchange for goods or as a sign of goodwill. An active knight may be moved across 2 open hex borders, even if there is no road on them. After moving across the open borders, the knight is deactivated. Knights may also move along friendly roads as normal, and move across 1 additional open hex border as part of the same movement. Knights may not move across water or opponent’s roads in this way. Knights need a friendly sea route to move across water. Knights may still never move across opposing roads or ships. If a knight is displaced while wandering off road, he is immediately removed from the board. Mighty knights can be used to deconstruct settlements, cities and roads. By spending 1 gold an active mighty knight may remove an adjacent road or a settlement in the same location or turn a city into a settlement. For 3 gold the mighty knight may deconstruct a bridge. Metropolises cannot be deconstructed. A hex conquered by knights (as described above) of a single color and no barbarians is Controlled, instead of conquered. A controlled hex still produces resources, but only for the controlling player. Similarly, only the controlling player can build anything new on or adjacent to that hex. Place a catan chit on the hex to show it is controlled. Thieves may not be placed on or adjacent to a controlled hex. To combat a player’s control of a hex, other players will have to use their knights to displace the controlling knights. Note that after a barbarian invasion, all knights are deactivated, which will remove the control of that hex, until those knights are active again. When a baggage train travels across a sea route, they do not move as normal. The baggage train immediately jumps from any one settlement or city to any other settlement or city on the same closed sea route. The baggage train must spend all of its MP while at the settlement or city and this movement uses all of the baggage train’s remaining MP. The baggage train may not spend a grain to gain extra MP to move away from the settlement it stops at after oversea travel. A baggage train may use an opposing color’s sea route by paying 3 gold to the owner of that sea route. The baggage train may bypass any coastal sea route, spending 2 MP per intersection as if moving along an intersection with no road. If the baggage train has to travel through a sea route that is, at any point, adjacent to the pirate, any toll that would be given to the player controlling the sea route, is instead given to the pirates. Place the gold that would be required for the toll on the barbarian advancement board. This represents the gold currently on the pirate’s ship. Any player may recover the stolen gold by using knights to plunder the pirate ship. This is described further under the Knights section. Due to the large map, the baggage train is granted 2 bonus MP at all times. Additionally, the baggage train receives twice as much gold as listed when it makes a delivery. For a baggage train to move across a river with no bridge costs 3 MP. Therefore, crossing a river with no bridge and a barbarian on it, costs 5 MP. Crossing a river with a bridge across it costs only 1 MP but you are still required to pay another player if the bridge belongs to them. The cost to cross an opposing player’s bridge is 2 gold. Payment for crossing any opposing roads is optional. The owner of the road or shipping line decides if the crossing player must pay or not. The owner of the roads or ships may request other goods in exchange for the gold-free passage. It would be possible for players to form an open trade route agreement, wherein both players may pass over each other roads for free. Wonders do not count for anything until they are finished. If a player loses the prerequisites for a Wonder while the Wonder is incomplete, that player may not continue to build the wonder until they regain the prerequisites. If a player loses the prerequisites of a Wonder after it is completed, the player retains use of the Wonder’s special ability. If a player builds a Great Bridge Wonder, they place one of their road segments across that intersection. For all purposes it counts as a road belonging to the player who built it, however, when a baggage train of an opposing color crosses it, they must pay 3 gold to the owning player. Controlling the Great Bridge allows the settlement or city connected to the Great Bridge to also connect resources from the other hex the Bridge is connected to. Lastly, even when gold stores are scarce, the Great Bridge allows you to uphold an air of superiority. If a player who controls a Great Bridge is tied for Poorest Settler with other player(s), the player who controls the Great Bridge does not hold a Poorest Settler token, while the other players do. If only two players are tied for poorest and they both control a Great Bridge, both players take the Poorest Settler token. If three or more players are tied for poorest and two of them control a Great Bridge, only the third player takes a Poorest Settler token. Ships can be built in the same intersection as where they Great Bridge would be built without interfering with the Great Bridge itself. The Great Bridge is large enough ships can sail underneath it. 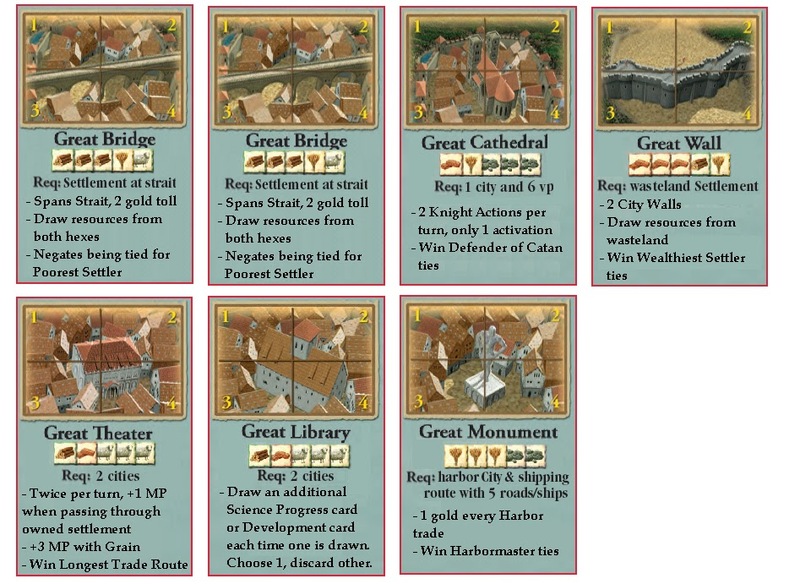 Building the Great Monument Wonder increases a player’s trade ability. Once the Great Monument is built, that player receives 1 gold from the bank anytime they trade through a harbor they control, not counting the standard 4:1 maritime trade. Additionally, that player may immediately take the Harbormaster card when he is tied with any other player for harbor points. With a Great Cathedral, your knights are more devoted to your cause and willing to push themselves for it. Any knights you control may take two actions per turn, although they may still only be activated once per turn and may move 3 intersections off-road with each action. Also, if your knights are the majority in conquering a hex when that hex would produce resources, you draw one of that resource, instead of it not being drawn at all. You can only draw resources, not commodities, in this way. Additionally, no thieves may be placed on an intersection or hex adjacent to one of your active Strong or Mighty knights. Lastly, during a barbarian invasion, if Catan is victorious and if you and other player(s) tie for Defender of Catan, you win the tie and take a Defender of Catan card. The Great Wall is considered two City Wall improvements, increasing your maximum hand size by 4. Living so close to the desert has taught you how to draw what you can from it. For each desert hex that makes up the Wasteland, roll the dice, rerolling on 2, 12, 6 or 8. The desert hex is considered to have that Production value for only you. Use extra Production chits or some other marker to note each hex’s new Production value. When you draw resources from the Wasteland, you draw 1 resource or commodity of your choice. These Wasteland hexes can be conquered by having multiple barbarians adjacent to them. Additionally, the player who controls the Great Wall may immediately take the Wealthiest Settler token when he is tied with any other player for amount of gold possessed. The Great Theater spreads your civilization’s culture and your citizens find themselves more welcoming of strangers passing through. Citizens of settlements and cities welcome passage of your travels. Your baggage train is helped along the way and given supplies as it passes through the land. Twice per turn, when your baggage train moves onto a settlement or city you control, it receives an extra 1 MP. When your baggage train spends a grain to gain extra MP, your baggage train gains 3 MP, instead of 2 MP. Additionally, the player who controls the Great Theater may immediately take the Longest Trade Route card when he is tied with any other player for longest trade route. Once a player finishes the Great Library, any time they draw a Science (Green) Progress Card or a Development card, they may draw an additional card from the same deck of cards, choose one and discard the other to the bottom of the deck. Additionally, if that player has not yet reached the Library city improvements, they are upgraded to having a Library city improvement for free. When a player draws resources for a gold hex, he gains 2 gold coins with a settlement, and 4 gold coins with a city on that hex. Players may not spend 4 fish or 2 gold to buy a commodity as they could normally for a resource. Players may sell commodities to the bank for gold at a 2:1 rate. (i.e. Two cloth for 1 gold). Spending 2 fish allows a player to move the robber into the desert (not the Wasteland) or the pirate offshore or move a barbarian adjacent to a location whose hexes currently have no adjacent barbarians at any adjacent hex. The player who spent the 2 fish does not steal any resources from this movement. Players may spend 5 fish for a ship but may not spend 5 fish and a brick for a bridge. Players may spend 6 fish for a bridge. Players may spend 2 fish as a substitute for grain to grant their baggage train additional MP. If a player about to lose a city due to a barbarian attack, that player may buy their way out of the barbarian destructiveness by paying 7 gold. Progress cards are obtained as they are in Cities and Knights. However, whenever players draw any Progress card, they are given the option to draw a Traders & Barbarians Development card, instead of the Progress Card. Development cards may only be purchased by spending 7 fish. Progress cards may not be purchased. Players may only hold a total of 4 cards in their hand at once, regardless of type of card. Drawing a 5th card while it is not your turn requires discarding. If the 5th card is drawn on your turn, you must play or discard one card by the end of your turn. Both Progress and Development cards may be played the turn they are acquired and multiple cards may be played each turn. The Spy Progress card allows players to look at another player’s entire Progress and Development hand. Not just the Progress Cards. Any victory point cards may be played immediately or may be held for a surprise victory. However, holding a victory point in your hand for extended periods of time runs the risk of it being stolen with the Spy Progress Card. The Swift Journey Development card considers land movement and sea movement as two separate movements. Therefore, by playing this Development card, a baggage train may move up to a port and sail across in a single turn, or sail across and continue moving over land. When playing the Wedding Progress card, players may choose to instead give 2 gold and a resource/commodity card or 4 gold. If a player giving resources does not have enough resource/commodity cards, they must give gold instead. The Diplomat card cannot be used to affect bridges or ships controlled by any players. If used to move a road adjacent to a river hex, the player playing the Diplomat must spend 1 gold to the bank (if moving his own roads) or to the player who owns the road (if affecting an opponents road). Any Road Building cards may be used to build ships instead. Players may not spend an extra brick when playing Road Building to place a bridge. While roads cannot be built around the outer edge of the trade hexes, players may still place coastal route ships around those hex borders. If a city is adjacent to a Forest (Lumber/Paper), Mountain (Ore/Coins) or Pasture (Wool/Cloth) hex, whenever that hex produces resources, that player who controls that city has the option to draw two resources instead of a resource and a commodity. The game ends once a player reached the required victory points and controls a completed Wonder on his turn. – Added ability to use knights to Conquer and Control hexes. – Great Cathedral allows majority conquering player to draw resources. – Added pirate interactions with coastal cities and the ability of plundering the pirate ship. – Conquered hexes are only unconquered when all barbarians are removed from the hex. – Altered how barbarians are moved with 2 fish. This entry was posted in barbarians, catan, cities, knights, mega, settlers, traders. Bookmark the permalink. Wow dude, you went nuts. Me and my roommates play with seafarers, fisherman (plus lake), and port master; we play to 15 points. We're thinking of adding the river which adds the gold/richest and poorest points, but we spent so much time balancing and perfecting our current setup its difficult to add anything. We have cities and knights and traders and barbarians but we haven't touched them. Think I might give your setup a try. Out of all the little additions Traders and Barbarians gives you, Rivers is easily my favorite. The addition of gold totally changes the game. It gets you out of that “I don't WANT to trade for that” situation all the time. With gold, you always have something worth trading. However, without the Traders and Barbarians scenario, getting more gold tends to be a hassle, unless you also throw in the Seafarer's gold hexes. Let me know how the game worked for you and please let me know if you have any suggestions! First of all, awesome work. There was clearly a lot of time and work involved in this. My group and I have been toying with the idea of Catan+Compatible Seafarers+Majority if not all of Barbarians+Cities and Knights. We looked at the Catan website and they have PDFs combining individual variants together, but not multiple. Did you run into any issues combining Caravans into this hence omitting it? I read when combining Caravans and Traders and Barbarians you take out the Longest Road point, kind of ruining the point of the camels. Would it ruin the game if you left in the Longest Road card while trying to add the camels into this? Just want to hear your thoughts on this. I found the official combination rules after I had started on this, but added the ones I could in later. You could probably put the Longest Road back in without too much effort. I think the biggest issue would be someone building a lot of roads and controlling the voting round to cinch down the Longest Road. Not really a huge problem, but getting 2 VP seems an unnecessary bonus in addition to everyone having to pay you tolls. Thanks for the comments and thanks for reading! Wow. Funny how house rules develop similarly across the world. FANTASTIC description. Printing and bringing to the next Catan night. Truly epic. Now if I could just get you to add in my “7 Wonders of Catan” expansion, things would be awesome. Would you ever consider doing a review of it? 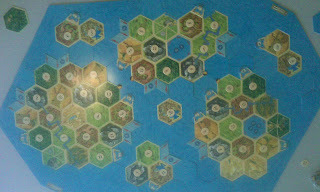 You can find it on the Board Game Geek Settlers of Catan page Download section. This is really great. I also have made something of my own. But I haven't come to playing it yet. It has almost every expension of Settlers of Catan. Basic, Seafarers, Cities & Knigths, Harbormaster, Fishermen, Camels (don't know how this is called in English, because I'm Dutch speaking), Rivers, Barbarian Attack, Traders & Barbarians (scenaria), 7Wonders from Scot a bit adjusted to my own, Diamants, Vulcanos, Jungle (the last three have custom rules but are from the seafarers expansion packs). Al with a specific setup witch has still some free rome to place you hexes as you please, but the rivers, castle, mines, desert with camels are fixed. When we pleytest it I'll give more comment about it.